What Are the Best Canned Refried Beans For Us? 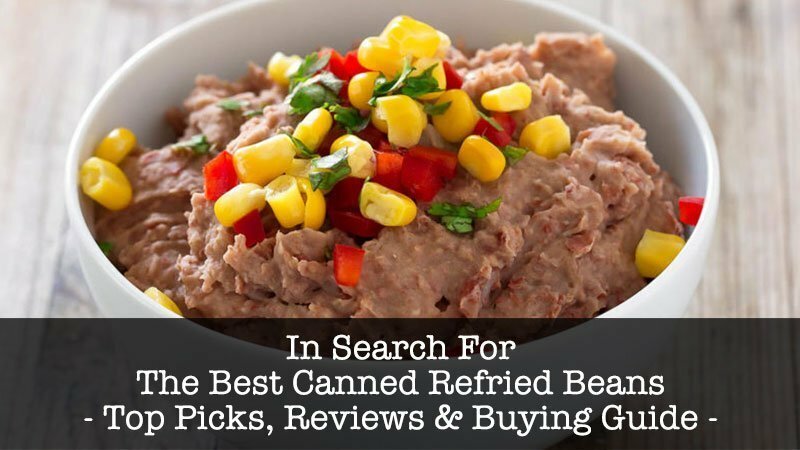 With so many options out there, we knew it wouldn’t be easy to find the best canned refried beans, and we certainly didn’t take our decision lightly. After an extensive search, we decided to give our first place award to Amy’s Organic Refried Beans, Mild with Green Chiles. Each 15-ounce can in this pack of 12 contains organic refried pinto beans, with peppers and chilis added to give them just a little heat to bring out the best in the beans’ flavor. But they’re not so spicy that they take away from the taste of your food or set your mouth on fire. Even kids can eat them, so they’re great for the whole family. Amy’s Organic Refried Beans make an excellent addition to your next taco or 7-layer dip. And they’re free of the additives and other elements that so many foods contain– such as gluten, soy, dairy, and trans fat– that can have a negative impact on our bodies. Sometimes something that’s marketed as “healthy” isn’t always the best-tasting, but scores of customers raved about the rich flavor of these beans and how well they complement Mexican meals and sides. What Types of Canned Refried Beans Are Available? Are Canned Fried Beans Healthy? What Are the Ingredients in Refried Beans? Beans are a must-have in many Latin American and Caribbean dishes. Browse your local grocery store or online market and you’ll see that there are an impressive number of options when it comes to canned refried beans. Some are better than others in terms of nutritional quality and flavor. How do you choose the product that’s right for you? Here are some factors to consider that will help make your next taco or burrito night exceptional. Refried beans tend to have a creamy consistency, but some of the best canned refried beans combine whole bean pieces with pureed beans for a chunky texture. Dehydrated beans have a harder texture because the moisture has been removed from them, but you can add water to achieve the consistency you want. Some canned refried beans come out thicker, while others are more soupy. The texture you select depends on your preferences and what you’ll be using the beans for. Some people like to just pop open a can and add cheese and perhaps a few other ingredients to make nachos, while others like to spend hours in the kitchen, carefully crafting elaborate Mexican cuisine– of which beans are a staple. Refried beans make tasty sides or fillers for tacos, burritos, and other foods. They can also serve as a base for soups and other recipes. You’ll be able to tell if the beans are vegetarian by what’s indicated on the label. Non-vegetarian refried beans are made with lard (a by-product of animal fat). Whether you stock your pantry with vegetarian or non-vegetarian beans depends on your tastes. If you or others in your household are trying to stay away from meat and animal products, vegetarian products may be the way to go. How Spicy Do You Like Them? This is a matter of personal preference. When it comes to the best refried beans, some people like a product that hasn’t been seasoned (except for maybe a little added salt). This gives them a base ingredient to work with. They can add their own herbs and spices, or combine the beans with rice, meat, and vegetables to customize their favorite dishes and achieve the flavor and amount of “heat” they want. 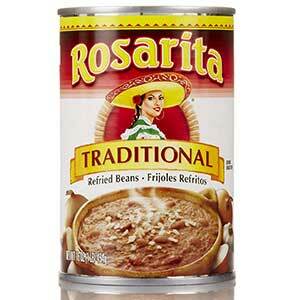 Other people prefer refried beans that already have a little “kick” to them, right out of the can. These beans have varying levels of chili peppers mixed in. You can find beans with just enough spice to enhance their flavor a bit, while others are hot enough to make your eyes water. Different types of refried beans can be used to complement your Mexican meals and other dishes. Pinto beans have a creamy consistency that works great with rice and vegetables and tastes great on a tortilla chip. Black beans are not only a flavorful addition to burritos and tacos, you can also use them as the primary ingredient in homemade veggie burgers. It’s easy to combine them with finely-chopped peppers, carrots, or other veggies of your choice to achieve the texture and flavor you want. You can also find refried kidney beans in a can, and these make a delicious addition to your favorite Mexican fare, too. You have three options in terms of the types of best canned refried beans. When you’re busy and don’t want to spend a lot of time in the kitchen doctoring up your beans with herbs and spices, this option will get the job done quickly. Just open the can and heat it in the microwave or on your stovetop. The beans are already seasoned, so they’re ready to eat as soon as they’re warm. All you have to do when preparing this kind is to add water and cook on a gas range or induction stove. Cook time is only about five minutes, and your beans will have a rich flavor. This option allows you to start pretty much from scratch. You cook the beans yourself and add whatever spices or other ingredients you want. This takes a little more time than the other two options, but if you like using your creativity in the kitchen, these beans will be a good choice for you. Naturally, you’re probably wondering whether canned fried beans are actually healthy. After all, anything canned usually contains preservatives, and anything fried brings to mind concerns about calories and cholesterol. How healthy they are depends on how they are prepared. If lard is used in the canning process, the beans are going to have higher levels of fat and cholesterol.Beans are packed with nutrients. Beans are excellent sources of potassium, iron, protein, carbohydrates, folate, and magnesium. They also contain healthy fats– soluble and insoluble– that benefit the body. Electrolytes and potassium help to reduce blood pressure. These traits make beans a great meat substitute for those who are vegetarian. Beans also provide the body with insoluble fiber, which aids in digestion and helps to regulate blood sugar. A lower glycemic index, in turn, helps to control appetite and hunger levels, making beans an especially smart diet choice for people who are trying to reach or maintain their ideal weight. When you prepare the beans yourself, you can decide what goes into them. That means it’s up to you how much fat and salt you should add. You can also include healthy spices and other foods to optimize the nutritional content of your meals. Read labels carefully when you’re shopping for refried beans. Ingredients vary from brand to brand, and even within brands– such as when a company markets refried beans in different flavors or vegetarian and non-vegetarian varieties. Depending on how the beans are processed, the number of calories, carbohydrates, and grams of fat per serving will vary. The most important thing to remember is that, when cooking beans yourself, there is a lot you can do to maximize the nutritional value of your favorite Mexican meals. The ingredients in the best canned refried beans depend on how they are prepared. The two primary ingredients are water and, of course, beans. When you look at the labels on non-vegetarian cans of beans, you will probably also see salt, lard, distilled vinegar, onions, garlic, and natural flavor listed among the ingredients. Some products also contain soy. One of the dangers of lard is that, during processing, it’s converted to trans fat, which raises levels of bad cholesterol in your body while reducing the good cholesterol. If you’re looking for the healthiest options, choose beans with little or no lard. This is why vegetarian options are so good for you, because they don’t contain animal fat by-products. We’ve looked at scores of brands and types of refried beans, done some taste-testing, and weighed the pros and cons outlined in customer reviews. Finally, we narrowed it down to the 10 best canned refried beans: Here’s what you should know before you plan your next fiesta. What You’ll Love: Amy’s Organic Refried Beans, with Green Chiles are great for sides and dips, contain all-natural ingredients, and are packed with plenty of flavor. The gold medal for best refried beans goes to Amy’s Organic Refried Beans, Mild with Green Chiles, 15.4 Ounce (Pack of 12). 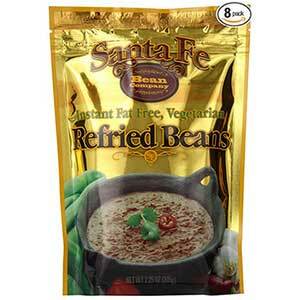 There is also a more recently-released version of this foodstuff available: Amy’s Bean Refried Green Chile, 12 oz. A USDA-certified organic product with no GMOs, it contains pinto beans, combined with green peppers and chilis. An ideal addition to Mexican and Southwest dishes, Amy’s organic refried beans are a good source of protein and fiber, and they contain no trans fat. Read the label on the can and you’ll see that these beans are a healthy option for those who have dietary concerns or are otherwise conscious about what they’re eating. You’ll notice that this product contains no gluten, dairy or lactose, soy, corn, or tree nuts, and it aligns with the criteria for vegan and Kosher foods. If you have high blood pressure or just want to limit your sodium intake, rest assured knowing that the beans have minimal sodium content. Green peppers add fresh flavor, while green chiles add just a hint of spice to give your tacos and burritos enough of a kick to enhance their taste without overwhelming your palette. It’s healthy, even for those with allergies or other concerns. Beans come in packs of 12, so you won’t run out for a while, unless you are cooking for a large crowd. This product is packed with flavor. Customers are satisfied with the price, too. These canned refried beans do come with a disclaimer warning customers that this food is manufactured in the same place where nuts, soy, and other potential allergens are processed, so potential customers who have concerns should be aware. What You’ll Love: These beans have a long shelf life, can be taken on-the-go, and are rich in nutrients and flavor. Looking for a nutritious snack or side that isn’t too hard on your wallet? After considerable review, Santa Fe Bean Company Instant Fat Free Vegetarian Refried Beans stood out as the best canned refried beans you can buy on a budget. You get eight 7.25-ounce packs of refried beans. An alternative to the canned or fresh varieties, these have been dehydrated, so there’s less mess. They’re gluten- and cholesterol-free, and high in protein and fiber and, because they’re dehydrated, you get more nutrients from them than you would from other types of all-natural refried beans. They’re also low in sodium. When you’re ready to add them to dips, main dishes, and sides, all you have to do is combine them with water to restore the fullness of their flavor and texture. There are many upsides to these refried beans. Many satisfied customers said these are much better than canned beans in terms of taste and texture. They have a pretty good shelf life– around 2 years, so you don’t have to worry about them expiring any time soon. Several customers admitted that it would be difficult for them to enjoy any other canned refried beans after sampling this exceptional product, which contains no genetically-modified elements. Pouches are easy to open and travel well– great for camping or any other occasion where you’re eating outside. Customers attest to the fact that there really aren’t many drawbacks to these refried beans. Some people commented that, while certainly affordable, this item is a bit more pricey to order online and have shipped than it would be if you found it at the local grocery store. However, they were so satisfied with the consistency and ease-of-preparation of these beans that the price tag was hardly a deal-breaker. What You’ll Love: You get 12 cans per pack, and the beans are prepared in such a way that they’re good as a stand-alone, or you can combine them with other foods for your next taco or Tex-Mex night. 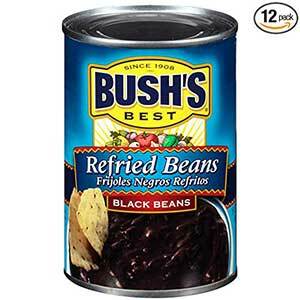 Bush’s Best Black Refried Beans came in at No. 1 in this category. You get a dozen 16-oz. cans of gluten-free, low-fat, refried beans. ngredients include water, cooked black beans, vinegar, onion powder, salt, spice, lard and hydrogenated lard, and garlic powder. Preparation is fast and easy– just heat them in the microwave for 1–2 minutes or on the stove for just a few minutes longer. Then you can add other seasonings or vegetables or serve them with rice or meat. Bush’s Refried Black Beans are tasty enough to enjoy by themselves, but versatile enough to be combined with other herbs, spices, and sides to make a great meal or snack. They are a frequent staple in salsas, burritos, fajitas, and more. Since you get 12 cans per order, you end up with enough to cook for a large group or have cans on hand for a while. Another plus: the price is reasonable. Customers didn’t have anything negative to say about Bush’s refried black beans. A few complained that the beans may be impossible to find at some grocery stores. Fortunately, they can still be ordered online. What You’ll Love: Rosarita Traditional Refried Beans provide authentic flavor to round out your favorite Mexican dishes, but they’re good enough to be eaten by themselves as a dip. They’re also nutritious and come with a modest price tag, giving you a lot of value for your purchase. 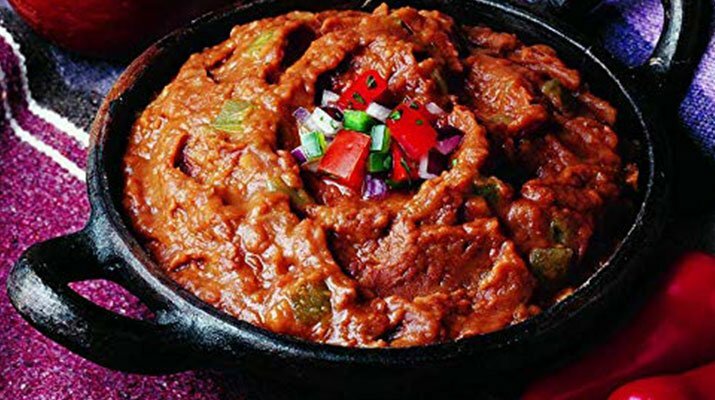 If you like traditional refried beans that can give your favorite Southwest and Latin cuisine a touch of authentic flavor, consider trying Rosarita Traditional Refried Beans. With just 120 calories per serving and zero trans fat, these beans are a good source of fiber, potassium, phosphorous, magnesium, and iron, making them a healthy addition to your favorite Mexican meals. Made according to a secret family recipe, Rosarita Traditional Refried Beans consist of bean pieces combined with creamy refried beans, creating a chunky texture that works well with chips, rice, salsa, and more. They have a smoky flavor that many people find enjoyable. Although these are not vegetarian, Rosarita does manufacture a vegetarian variety of these beans (which will be listed on the label). You can also find “spicy” and “no-fat” options. This item contains lard, which is a product of animal fat. 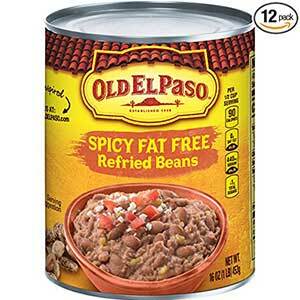 Most customers raved about the great taste of these refried beans, with one customer referring to them as a “Mexican restaurant in a can.” They’re nutritious and don’t contain too many calories per serving. If you’re looking for refried beans with more of a pasty consistency, you won’t find them here. Most complaints about this product had more to do with dented cans than any perceived shortcomings in the beans. What You’ll Love: These Taco Bell refried beans are vegetarian and fat-free– a good purchase for those who are trying to be more diet-conscious or have certain food allergies. Most people love the taste and find it similar to what you can order at Taco Bell restaurants. If you’re trying to include more fat-free, vegetarian options in your diet, you don’t have to forgo refried beans altogether. 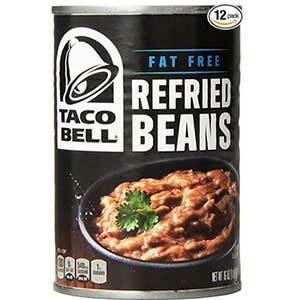 You can enjoy Taco Bell Fat-Free Refried Beans without guilt. Ingredients include cooked pinto beans, less than 2% salt, dried onions, garlic, and pink beans, natural flavor, soy bean oil, and lecithin. This order comes with twelve 16-ounce cans. In addition to the fat-free vegetarian kind, you can also find these in an Original vegetarian flavor. You can enjoy these as a dip or use them to fill burritos, tacos, and similar foods. According to many happy customers, these refried beans do in fact taste like the kind you can get from Taco Bell, with an enjoyable texture and flavor. They’re gluten-free, fat-free, and vegetarian, a plus for people who are following special diets or just trying to be more health-conscious. Not too many complaints about this product. A few people said they didn’t like the thick consistency of the beans. If you want to thin them out, just add a little water. If you don’t like to use a can opener, you may be disappointed to know that the cans don’t have pop tops. Many local stores don’t carry these, so you may have to turn to the Internet to find them, but at least you can buy them in large quantities that way. What You’ll Love: Old El Paso refried beans have just enough heat to enhance their flavor, but not so much that they set your mouth on fire. Rich in fiber and protein, they’re fat-and cholesterol-free and make an excellent addition to Mexican meals or can be enjoyed as a dip, with a little cheese and a pile of tortilla chips. If you like fat-free refried beans with a little kick, check out these Old El Paso Refried Spicy Beans. They come in a 12-pack of 16-oz. cans, and they’re cholesterol-free, fat-free, and packed with protein. Ingredients include cooked beans, jalapeno pepper, less than 2% salt, water, chili powder, tomato paste, sugar, natural flavor, yeast extract, and the preservative acetic acid. They have just enough spice to enhance their flavor without being overwhelming. Preparation is easy, too. Just warm over low heat on the stovetop, or pop them in the microwave for 2–2-1/2 minutes, and enjoy. Old El Paso refried beans make great sides and dips, but can be combined with a variety of other foods, too. These beans have a pleasing taste and texture. They have a variety of uses, from burrito-filler to soup-thickener. They provide a healthier alternative to some other refried beans options that contain many additives or high levels of fat. Buyers were also satisfied with the price, especially since, in many cases, they couldn’t find this product in their local grocery store or could pay less for it online that at an on-ground location. The cans for these beans don’t come with pull tabs, so you’ll have to break out the trusty can opener, which some people find a nuisance, but not a deal-breaker. Most complaints were about dented cans. What You’ll Love: These beans have great flavor and are packed with nutrients and low in fat. They make a great addition to your favorite Mexican dishes. 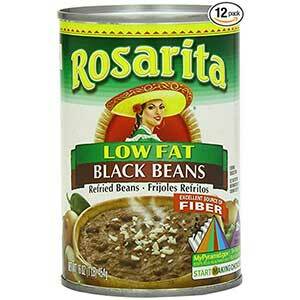 Rosarita Low-Fat Refried Black Beans ranked as the best canned refried beans that are also low in fat. Each of the twelve cans in this pack contains the following ingredients: water, salt (less than 2%), cooked beans, jalapenos, chile peppers, distilled vinegar, spices, garlic powder, onion powder, autolyzed yeast, and natural flavor. They’re lightly seasoned to enhance their flavor, but provide lots of room for you to add your own ingredients. Made from a secret family recipe, Rosarita Low-Fat Refried Black Beans give you an authentic taste of Old Mexico. Great taste, plenty of nutritional value. They can be used for a variety of purposes to customize South-of-the-border meals and snacks. It was hard to find anything to complain about. As can be expected with any food product, there were a few customers who weren’t satisfied with the taste and price of the refried beans. What You’ll Love: These refried beans are a bit softer in texture than some other varieties of refried beans, good for spreading in dips and soups. They’re nutrient-dense and low in sodium, and they come with a modest price tag. 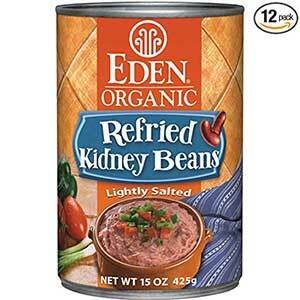 For anyone looking for a healthy snack or side for Mexican fare, we suggest you sample a can of Eden Organic Refried Kidney Beans. The 12-pack comes with 15-ounce cans, so you have plenty for the whole family. Cans contain a mixture of whole and pureed beans for a chunky consistency that tastes great in soups, burritos, fajitas, and more. These are packed with nutrients– potassium, iron, magnesium, and protein– but they’re low in fat and contain 50% less sodium than most other refried bean brands. They are seasoned with a bit of sea salt, a healthy alternative to table salt. Those with special dietary considerations will be happy to know that Eden Kosher organic refried kidney beans are wheat- and gluten-free. Cans are bisphenol-A (BPA) free. Beans have lots of nutrients and are seasoned just enough to give them some flavor, but give you plenty of leeway to add your own spices or combine the beans with other foods for tasty meals or snacks. You can purchase a pack of refried kidney beans at a reasonable price. Some people found these beans to be too bland, but you can always add your own seasonings. What You’ll Love: Eden’s Organic Refried Pinto Beans are certified-organic, with all-natural ingredients and no harmful additives. For many customers, the best part about buying these beans is knowing that the cans are BPA-free. 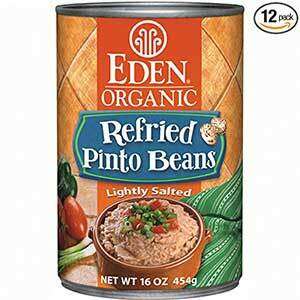 When it came to finding the best canned refried pinto beans, we decided on Eden Organic Pinto Beans as our top pick. Prepared in a Kosher and pareve cannery, these USDA organic pinto beans are lightly seasoned with EDEN sea salt to enhance their flavor. That gives you lots of leeway to add your own ingredients to achieve the flavor you want. They contain about half as much sodium as other brands, and they’re low in fat and saturdated fat. All-natural ingredients include water, sea salt, and organic pinto beans, so there are no additives or GMOSs to worry about. Cans are bisphenol-A (BPA) free, so there are no harmful synthetics coming into contact with your food. What customers seemed to like most about this product is that it’s BPA-free. Many also appreciated that the beans are only lightly salted, so they appeal to people who like a mild flavor or those who want to add their own herbs and spices. Refried pinto beans are nutrient-dense and made with natural ingredients. Some people didn’t like the texture of the beans or found them to be too bland, even after adding other ingredients. What You’ll Love: Refried pinto beans work well as dips and sides. The best part: they’re organic and give you the flexibility to prepare them just the way you like. 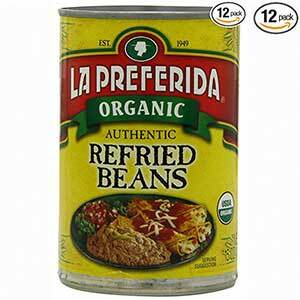 Another all-natural product that we like is La Preferida Organic Refried Beans. Ingredients in each can include organic pinto beans, water, and salt. They make a great addition to any Mexican meal. Without any lard, additives, or extra seasonings, these organic beans allow for lots of creativity in adding your own herbs and spices. Their creamy consistency makes a good bean base for soups and dips. These beans have great flavor, and since they’re organic, you don’t have to worry about harmful additives. The texture of the beans may not be the best for people who are looking for something a little more chunky.